How to Import to Liechtenstein? How to import to Liechtenstein? What are the import procedures in Liechtenstein to move goods? Explain about import registration process, cargo movement to Liechtenstein from overseas countries, Import delivery process in Liechtenstein etc. Detail the import methodology in Liechtenstein. This post explains about step by step procedures that need to be finished with Liechtenstein government authority for importation to Liechtenstein. All natural persons or legal entities are approved to conduct export and import process in Liechtenstein. For commercial purpose, a registered trade with concerned license (if required) as per the business and have enlisted in the Trade and Company Register of the country is must for exporting and importing of products from and to Liechtenstein. If a firm or company wants to import or export into or from Liechtenstein, then they should register for an EORI number. The EORI number stands for Economic Operator Registration and Identification and it comprises of a code which allows identification of each economic operator that is in connection to custom administrations. The residents in Liechtenstein or the legal entities from outside the EU who engage in commercial activities in Liechtenstein are permitted to register for the EORI number in Liechtenstein. The number can be obtained by registration to the Liechtenstein customs. Liechtenstein is a member of the European Economic Area (EEA) and forms part of a customs union with Switzerland. This means that its businesses have direct access to the markets in the EEA and Switzerland as well as to the domestic market in Liechtenstein. But Liechtenstein is not a part of the EU. The documents may have to be prepared in a special way to comply with the requirements of the import or export country. Understanding the right documents is essential for smooth import and export procedures. The import documents required in Liechtenstein depends up on the regular trade policy of Liechtenstein Government, the nature of goods importing, specific goods importing to Liechtenstein. 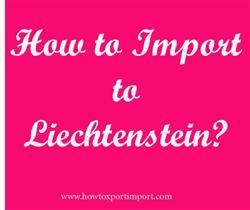 This post explains about different phases in import process that every importer needs to go through in Liechtenstein. Import registration procedures required in Balzers. Import Licence process in Eschen. Process to import to Ruggell. Formalities for import to Ruggell. Procedures to import to Mauren. Need to import to Eschen. How can I clear customs to import in Balzers. What Customs formalities required to import in Balzers. Information to import to Schaan. Step by step process to import to Ruggell. Methods to import to Vaduz. Guidelines to import to Schaanwald. Please guide to import to Eschen. Help to import to Schaan. Procedures required to import to Planken. Requirements to import to Vaduz. Clarifications to import to Mauren. Which documents should I provide at Ruggell customs port location for import. Documents need to move cargo out of customs at Planken port customs location. What should I do to import to Vaduz. How to settle dispute in Exports and Imports? How to export from Gabon? How to Import to Gabon? How to import to India from Gabon? How to export from India to Gabon? Who has to obtain GST registration in India? Does GST registration number of my firm change time to time in India? Is GST registration required for a public sector undertaking? Retired from business ownership. Fresh GST registration in India? How to export from Liechtenstein? How to import to India from Liechtenstein? How to export from India to Liechtenstein? How to Import to Lithuania? How to Import to Liberia? How to Import to Luxembourg? How to Import to Slovenia? How to Import to Guyana? How to Import to Jamaica? How to Import to Bosnia and Herzegovina?